Another Gajendramoksham- హనుమాద్గాదా తరంగిణి అనే హనుమద్ చరితామృతం - 45. Hanuman was travelling through a dense forest and he heard a pathetic cry of an elephant. Hanuman was surprised to hear that helpless cry from an elephant because as far as he knew, there were no predators for elephants in the forest. Most of them usually died a natural death unlike other small animals of the food chain. Anyway he moved swiftly to the place from where he heard the cry. 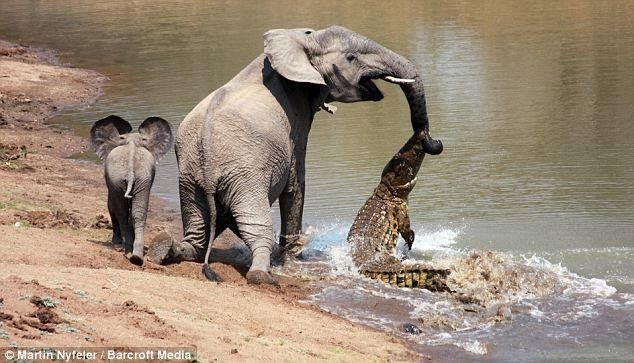 To his astonishment, he saw an elephant struggling to free himself from the jaws of a huge crocodile. Hanumanji, would have probably remembered the elephant who were once King Indradyumnan struggling in the jaws of the crocodile who were once a Gandharvan called Huhu. He would have probably said the manthram ":Naaraayanaa! AkhilagurO! Namasthe" and jumped on the crocodile to save the poor elephant. It was a tough fight and Hanumanji found it hard to free him. Finally, taking the poundings of the tail of the crocodile on himself he caught the jaws and kept them as wide as possible and somehow freed the elephant. Then he caught it on his tail and circled several times above his head and hit it's head on the rock nearby. Instantly crocodile died and from it's body emerged a beautiful woman. She did namaskaar to Hanumanji and told her story. She was a celestial woman by the name Ambalika and was cursed by a sage when she did not pay respect to him and disturbed his penance by singing and dancing around him. 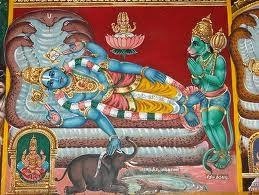 Later he gave shaapamoksham or relief from the curse saying that Hanuman, the son of Anjana Devi would come to save her from the crocodile's janmam. She blessed Hanuman and went to heavens, the abode of Devaas. జన్మ నామాలకు నక్షత్రాలను తెలుసుకోవటం ఎలా ? శుక్లాంబర ధరం విష్ణుం = గణపతీ! చంద్రుడి అనుగ్రహాన్ని ఇలా పొందవచ్చు ! పూజా ఫలం పరిపూర్ణంగా దక్కాలంటే ? శివాయ గురవే నమః! శ్రీమాత్రే నమః!! శరీరంలో పల్స్ రేటును నిలకడగా ఉంచే ఆహారాలు..! ఆలయాలు ఎందుకు?? మనం ఆలయానికి ఎందుకు వెళ్ళాలి? ?